So, the Arts and Humanities Council is attempting to find the UK’s favourite book about nature. This is no easy feat. There are so many wonderful books about nature, but I think the children’s book world excels in this. My book of the week the other week was The Lost Words, and you’d be hard pushed to find a better paean to our natural world. Yet, there is another writer who is doing a great deal to draw the attention of the nation’s children to the natural world and our environment. 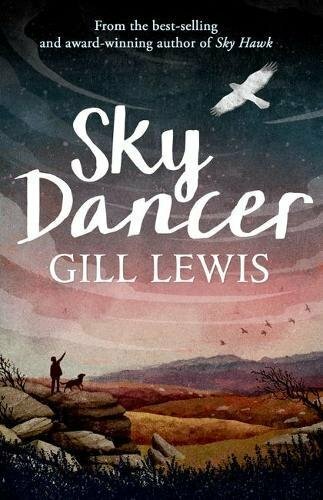 I reviewed Gorilla Dawn by Gill Lewis a while ago – a revelatory novel that brings the world’s attention to the gorillas affected by coltan mining, but in Sky Dancer, Lewis hits a spot closer to home, basing her novel here in the UK, and returning to the style and themes that led her to write Sky Hawk in 2011. Her latest novel for children, Sky Dancer, addresses the issue of the hen harrier, one of the most threatened birds of prey in the UK, remaining rare due to habitat loss, weather and illegal killing. It’s this last aspect that Lewis tackles in her book, but this novel is not an ‘issue’ book – it’s an incredibly insightful, emotional picture of who we are, and how we are shaping modern Britain. Three children trek the landscape of this startlingly astute novel: Joe, reeling from his father’s death, and caught in the middle of a battle for the fate of the hen harriers who nest in the heather of the moorlands where he lives. There’s also Minty, the stylish confident daughter of landowners who use the land for grouse shooting, and for whom the hen harriers are a nuisance, and lastly Ella, who seems to be a naive and rather insecure urbanite, but who manages to think as an outsider – finding solutions to which those in the midst of the struggle are blinded. In the end, these three unlikely friends, find their way forward, and a way forward for the hen harriers. They are each drawn terrifically authentically, with clear ideas of their roots and social class, and their struggles and difficulties. Whether it be divorced or deceased parents, or simply parents with whom one disagrees, Lewis portrays the different make-up of families, and the way in which the children deal with their different situations. Joe, in particular, is fascinating. He is at the centre of the struggle, torn sometimes between the two girls and their different views of past and present. He also has to face up to how his father acted and the consequences of that, as well as how his older brother is currently acting – what’s morally right, what’s right for his family, and what’s right for the environment. When these things aren’t the same, he has to reconcile his conscience with how to act. Told from Joe’s point of view, the reader is privileged to see what happens in his head, particularly as he’s a quiet child, loathe to speak in many cases. Lewis has accomplished a great character here, complex, sensitive and real. Not only is the book a gripping read, but it also sparks thoughts on a range of topics: the fate of hen harriers, and the impact, and other preoccupations of the modern world such as accepting difference, the meeting of technology and nature, town and country, and questions of heritage; which traditions should continue and what needs to adapt. Of course the book explores life on a hunting estate, in which grouse shooting is fundamental to its past traditions and current livelihood, and although that might feel remote to many young people reading the book, Lewis cleverly explores how it is not dissimilar to anywhere a child is growing up, in that there are the same battles and choices – the intertwining of community, loyalty, family and friendship. Lewis writes with terrific empathy, eking out the reader’s sympathy for different characters at different stages of the novel, and she also evokes an extremely visual landscape, at the same time as propelling the plot – it darts along swiftly. A captivating read that will make you think, and also imagine that you’re striding across the moors, scanning the sky for dancers. You can buy it here.